Supported by International Maize and Wheat Improvement Center, U.S. Agency for International Development, and the Oregon Agricultural Experiment Station. 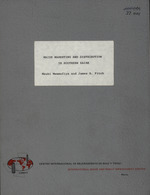 Mbuki Mwamufiya and James B. Fitch. The University of Florida George A. Smathers Libraries respect the intellectual property rights of others and do not claim any copyright interest in this item. This item may be protected by copyright but is made available here under a claim of fair use (17 U.S.C. Â§107) for non-profit research and educational purposes. Users of this work have responsibility for determining copyright status prior to reusing, publishing or reproducing this item for purposes other than what is allowed by fair use or other copyright exemptions. Any reuse of this item in excess of fair use or other copyright exemptions requires permission of the copyright holder. The Smathers Libraries would like to learn more about this item and invite individuals or organizations to contact Digital Services (UFDC@uflib.ufl.edu) with any additional information they can provide. Dr. Mwamufiya recently received the Ph.D. from Oregon State University, and Dr. Fitch is Assistant Professor in the Department of Agricultural and Resouce Economics at Oregon State University. CIMMYT, the U.S. Agency for International Development, and the Oregon Agricultural Experiment Station. The authors are particularly indebted to Don Winkelmann for his continued support and comments. Frank Conklin and Carl. O'Connor also made useful comments on an early draft of the manuscript. Naturally, responsibility for any flaws in the final product remains solely with the authors. significant influences upon both the supply and the demand for basic foods, with profound effects being registered on maize in urban Shaba and in the Kasai regions. Urban demand for food, such as maize, increased rapidly (Table 1), not only as a result of population increases, but also due to investment and income distribution policies which favored urban areas [12, pp. 2-61. These factors present a problem of developing an expanded production system, together with a distribution system capable of delivering more food to the growing urban market. This paper focuses on the marketing of maize and is directed to improving the understanding of factors which influence the nature and effectiveness of the marketing process. Information presented here is based on a study of the production and marketing of maize in the districts of Tshilenge, Gandajika, Mwene-Ditu, and Kaniama, in south-central Zaire. This included a 1974-75 survey of 299 producers interviewed in their villages, a separate survey of 93 producers who were selling their maize in rural and urban markets of the Kasai Oriental region, and the analysis of the retail. price shares received by various marketing agents in each of three different types of rural-urban market channels. These results are more fully discussed in an Oregon State University Ph.D. thesis by one of the authors . In the four districts where surveys were conducted, farmers were found to allocate the maize harvested among consumption needs, seed for future plantings, gifts, payment to outside labor used for harvest, bartering, and sale. Table 2 shows that home consumption was found to be a universal use, and that setting maize aside for seed was nearly so. On the other hand, very few farmers used maize for animal feed, to pay hired harvest labor, or as a gift to the village chief. In all districts, except Kaniama, producers reported using maize for bartering more frequently than for sale. Over all four of the districts surveyed, 65 percent of the producers did report selling maize. The survey also showed that for those producers who do sell meize, sales average 29 percent of total production. 1974.......... 52,,00o 125,760- 0 170,0001 295,760SOURCE S: [1-6, 9. p. 58; 14, p. 55]. SOURC : [12, p. 3231.
in consumption, maize and cassava flour are mixed with boiling water in the cooking of a thick paste ca led "fufu", "bidia", or "nshima", which serves as the basic food in the survey districts. Maize is also used in the preparation of "tshibuku", "tchorst", and "cinq cent", which are three alcoholic beverages produced by villagers. Tshibuku and tchorst are cheaper than beer and many use it because of its unique taste, or as a substitute to the more expensive beer. All farmers interviewed in the study districts acknowledged using maize in the preparation of fufu. Of those interviewed, 87 percent said they used maize throughout the year. Some 81 percent reported eating fufu twice a day. Most households of the study area rix maize flour and cassava flour in the preparation of fufu, but the propo tion of maize flour actually used varies depending upon availability. Whero the average area planted in maize is larger, such as was the case of fa mers in Kaniama and Gandajika districts, farmers tend to use more maize flour in the preparation of fufu than farmers in districts where the average mai .e area is smaller, such as was the case of the districts of Mwene-Ditu and Tshilenge. Nevertheless, the survey also showed that regional preferences for maize flour in fufu do not coincide exactly with patterns of availabilLty [12, pp. 159-161]. important in determining whether o not a producer will sell maize, but the following alysis shows that seve al other factors also influence the decision to sell. explanatory variables which were retained in the analysis after the preliminary variable selection procedures are shown in the table. Average values for the variables are shown for both maize sellers and for non-sellers. Table 3 then lists the standardized weights for each variable in the final discriminant function. Those variables which are statistically significant at the ten percent level, based on a partial F-statistic, are marked with an asterisk (*) in the table. marketing neos programs for the areas surveyed. None of the farmers interviewed lisLCd the radio as a primary source of information. prefer to put in a batch of fufu requiring five handfulls of flour. Indicates significance at the 10 percent level, based on a partial F-test. as well as a certain amount of assistance from government-owned machinery.Thr! positive influence of total area planted to crops is taken to mean that the larger an area a farmer is able to crop, the more likely he will be to have surplus left over for sale. The fact that total area planted to maize was not significant in distinguishing among maize sellers and non-sellers is perplexing. in view of the high correlation between total crop area and the total area in maize variables (r = 0.55), however, this is probably just a aacc of the former masking the significance of the latter. fall less frequently into the maize seller category.The negative effect of distance to market on the decision to sell maize was expected. as was that of the relative degree of maize used in fufu mix. The lattei variable was included as a proxy to indicate the preference for maize in consumption. Thus, a stronger preference for consuming maize weakens the propensity to sell maize. have a residual effect on maize production in subsequent rotations. r:te, ~anks highest in terms of farmers who sell but do not barter. Government efforts to regulate the marketing of maize are focused primarily in price policies which affect the market for maize flour as well as that for maize grain. In addition to these price policies, which are imposed by the national government, many regional and local (municipal) governments have established regulations on the purchase of maize by licensed traders operating within their jurLsdictions [12, pp. 203-2041. Potentially of most direct effect on farmers is a floor price which is to apply to the purchase of mai:e grain at the farm level. However, great confusion exists on the concept and application of floor prices. While top officials know what the floor price is supposed to be,5/ this understanding does not seem to be shared by the many local and regional officials who would normally be expected to enforce it. Many of these officials in fact call it "the official price", "the government price", and even "the official maximum price" [12, p. 2551, a clear indication of the degree of misunderstanding. This confusion undoubtedly contributes to an almost universal lack of awareness of the floor price policy on the part of farmers. Of the 299 farmers interviewed in four different districts in 1974-75, only six percent knew (cf the existence of such a government policy, and less than two percent could state the actual floor price in effect at the time [12, p. 256]. A second set of maize price policies is aimed at the milling process. On one hand, a ceiling price is set for the delivery of maize grain to flour mills, whereas, on the other, a ceiling is set on the wholesale price of flour produced by the mills [12, pp. 250-253]. These ceiling prices tend to reduce the incentive for traders to collect maize from the more outlying villages -- those lying 30 to 40 or more kilometers from the main roads and railroad tracks. Thus, one result of the ceilings policy is a decreased incentive for farmers -- especially those who are more distant from market -to produce maize [12, pp. 257-263]. unit, and the official exchange rate was U.S. $2.00 per Zaire. Because of the price ceilings and due also to slow response in changing these ceilings as conditions of national supply and demand for maize change, there tends to be a large differential between the delivery price of locally produced maize and the price which flour mills must pay for maize imports (Table 4). The existence of this differential suggests that substantial reduction in imports (Table 1) and savings in foreign exchange might be obtained merely by permitting the domestic mill delivery price to rise, thus stimulating the local production and supply of maize. aImport price not available for 1974. Local and regional officials frequently intervene in the maize market in a more direct fashion. These actions often have the effect of restricting trade between towns and regions. These interventions are usually motivated by seasonal shortages in local markets. In Shaba, a regional ordinance banned the export of maize beyond the regional boundary, and in 1975, the Kasai Oriental government was considering a similar edict as a form of retaliation. Licensing of traders, as required by local and regional governments in Kasai Oriental, Kasai Occidental, and Shaba, may also be designed to restrict trade. In the latter two. regions, in 1975, the issuing of such licenses was contingent on the trader indicating which districts maize would be bought from, as well as on his agreement to sell to a designated flo'ir mill. While such moves are evidently intended to secure local supplies in the short run, they tend to limit the number of maize traders, and thus to limit competition in maize trade. Furthermore, by promoting disparities in maize prices among regions, these policies are likely to lead to an inefficient allocation of resources in the production of maize. A pattern whereby some districts produce "too much"~ maize, while others produce "too little", will thereby be perpetuated. containers. Many farmers sell their maize at home in their villages, hil~ others take it to rural and urban markets where they sell cto assemblers ho collect for later sale to othe: intermediaries or to consumers. The discriminant analysis demonstrated that farmers who are located closer to organized markets show a greater propensity to sell maize. There are a number of different types of maize buyers who work in the various ural and urban markets and directly in the production areas. Small scale bclers who operate in isolated villages and in rural markets are referred to here as local assembles. Buyers operating between rural and urban markets are called rural and urban assemblers. Truck-owner-licensedtraders operate all the way from remote rural markets to the centrally located urban markets. Data from :he various study districts, shown in Table 5, indicate that from 29 to 52 percent of the farmers sell most of their maize to local assemblers and local consumers. From 20 to 64 percent sell to rural and urban assemblers, and 7 to 21 percent sell directly to licensed traders. farmers tend to sell at home in their village. But in more densely populated districts, such as Tshilenge, Gandajika, and Mwene-Ditu, there is a tendency for farmers to take their maize directly to rural and/or urban markets. Mny direct sales by producers were also observed in the town of Mbuji-Mayi. n ~~ ore densely populated districts, numerous buyers are act. rural aks, particularly during the first two to three months after maize harvest. Because of bad roads and limited transportation servic-e most of thV snaizc bought by these small-scale rural assemblers has to I, carried in ,ad loads to shipping points or other markets. This means the activities of most rural assemblers are restricted to areas within distances of main roads and some secondary roads. Truck-owner-licensed-traders who buy maize are unspecialized season buyers who deal mainly in the buying and selling of consumer manufacture goods. These traders can devote larger sums of money to maize purchaseand can reach more remote markets and villages. Nevertheless, their aic are also limited by the poor road network. Thus, the number of trader. assemblers who reach the more remote villages is limited, and this apr to limit the competition for the purchase of maize in such areas. The marketing chain nearer to the large consumption centers involve, numerous intermediaries. During the survey, this was especially evident in the Mbuji-Mayi-Gandajika interurban link. The high price of maize C consumption centers, the prospect of positive retail margins, and higl of urban unemployment in these cities have induced many to enter the maic retailing business. Because of limited working capital, these retailer run very sJmall-scale operations. Thus, as maize travels in from the cous side it- is frequently split into smaller loads and handled by numerous retailers. markets depends upon the seasonal variation in supply. In the three to four months following harvest, many producers and assemblers are active in both rural and urban markets, and this results in a competitive environment which undoubtedly helps to keep prices down. As the period after harvest lengthens, however, wholesale supplies become dominated by urban and rural assemblers as well as truck-owner-licensed-traders, and the degree of competition in the maize market decreases gradually, particularly at the wholesale and semi-wholesale levels. Analysis of a subsystem of the marketing chain in the Hbuji-Mayi and Gandajika areas indicates that most maize producers do not store maize for speculative purposes, to gain from seasonal price variations; rather, most producers sell maize to assemblers and traders, and it is this group who often store for future sales. The same analysis also indicates that as producers become rare in the market, competition among sellers is gradually affected [12, p. 220], and by July or August, the wholesale supply of maize grain is dominated by few truck-owner-licensed-traders who, in some cases, run an integrated operation from the wholesale to the retail level. This pattern of supply may be responsible for some of the price increases noticed in the last months of the marketing season [12, p. 223]. high shortages of maize grain, some maize can also move from the Mbuji-Mayi metropolitan urban market to the Gandajika regional urban market, as was observed in October through December 1974. Seasonal price variations for the period of December 1974 to December 1975 are listed in Table 8 for rural and urban markets. the forthcoming maize harvest in late December and in January- The simultaneity of seasonal price changes in all markets suggests that there exists a relatively good flow of information on supply and demand between the markets studied here. Presumably, price changes in the metropolitan market in Mbuji-Mayi are transmitted to the regional urban markets in Gandajika, then onto the non-isclated rural markets at Kamanda, Kaseki, and Nsona. Under perfect competition and perfect information in the spatially located rural and urban markets studied, maize prices would tend to move toward equilibrium. Equilibrium prices for Gandajika and any trading rural markets, as well as equilibrium prices for Mbuji-Mayi and Gandajika, would differ by the cost of transferring maize between trading markets. A price differential above the transfer cost of shipping maize from one market to another trading market would indicate that marketing agents could benefit from shipping more maize from their own markets to other trading markets. The following section investigates the performance of the urban rural link. markets located in geographic areas accessible from urban consumer centers. maize between the ith and the kth markets is then defined as the parity price Pik, less the retail price of maize in the kth market, Pk. In theory, a substantially positive price spread would provide a potential opportunity for assemblers or producers to make more than normal profits while a negative spread would be a disincentive and would serve to reduce the volume of trade between the kth and the ith market:. Figures 1 through 3 indicate that shortly after the first maize harvest in February and March, and in the period following the second maize harvest in May and June, there is a positive price spread, indicating that producers could benefit from selling maize directly in the Gandajika urban market. Producers and assemblers could benefit by an even greater amount from selling directly in Gandajika market during the period of July or August to October or November. An observation of market attendance in February and March 1975 indicates that producers did respond to price differentials taking their maize directly to the Gandajika or the Hbuji-Mayi urban market [12, p. 191-202]. The figures indicate that response was nearly sufficient to eliminate the positive price spread. Evidently the response was weaker during September and October, when general scarcity and high prices were experienced. During this period, the price spread became quite large in all three markets. 2od4ia -o sn 246odjk) 24 1- ."A,. ph, . 1975. Source: 16, p. 228 1975. Source: 16, p. 229 1975. Source: 16, p. 236 . -nd maize protection practices in the districts of Tshilenge, Gandajika, and Mwene-Ditu and Kaniama shows difficulties with molding and sprouting and substantial transfer of weevils from the field to the grainery [12, pp. 105-1061. Thus, a better system of maize storage and protection could help farmers to successfully spread their sales over the maize season. The extreme seasonal variation in price observed during 1974-75 suggests that storage may be profitable, altlaough final determination on that must be subject to further investigation. If successful, storage facilities could serve to stimulate the production and selling of more maize. The share of the retail price received by maize producers depends on the degree of competition in the maize market and the cost of transferring maize from the production site to t:ie retail market. Over time, the share of the seasonal price variations received by producers depends on when these producers get their maize in '-he market. An analysis of the components which make up retail price indicate,. that, in the rural-urban link between the Gandajika urban market and the ]:amanda rural market, producers received 1,7,5 percent of the retail price in February-March, 1975 (Table 8). SOURCf E: [12, p. 232]. Figure 3, which is based on retail prices in both markets. The analysis also indicates that producers who were able to get their maize to the Gandajika market and convey it to Mbuji-Mayi were able to capture a larger share of the retail or wholesale price [12, pp. 239-243] (Table 9). The single factor which most affected the producers' share was the cost of transporting maize, particularly between rural markets and urban markets. The lower share of transportation in transactions involving urban markets may in part result from greater competition among transporters between urban markets. The high share of transportation in the study area contrasts w'th the situation in Northern Nigeria, for example, where Hays and McCoy found that transportation accounted only for 5.4 percent of the retail price for sorghum and 6.5 percent of the retail price of millet, and where the producer's share accounted for 69.8 percent of the retail price of sorghum and 68.2 percent of the retail price of millet [7, p. 17]. Because of limited capital and because of the high cost of transportation, many producers located in the neighborhood of the Gandajika market carry their maize in headloads directly to the urban market. In so doing, many producers take weekly trips to markets. However, some crops have planting or weeding periods which coincide with the selling period for maize. Farmers who plant such crops simply may not have time available to perform their own marketing [12, p. 238-239]. The proportion of the seasonal price variations which is captured by producers is a function of how producers spread their sales over the maize season. Survey data indicate that 44.9 percent of the farmers in the district of Gandajika, 60.5 percent in Kanama, 67.9 percent in Mwene-Ditu, and 76.9 percent of the producers in Tshilenge sell most of their maize within six months after harvest (Table 10) and, thus, do not benefit from price rises during the September to December period. Observation of marketing practices in tue G, ndajika, Tshilenge, and M:ene-Ditu districts also indicates that it is not the producer, but the rural and urban assemblers, and the licensed traders who collect and store maize for sale during the period of shortages. A variety of factors were shovn to influence the decision to sell maize. On the one hand, factors which are difficult to control, such as the size of family, size of village, the preference for maize in fufu, and prior exposure to the "modern" or monetied economy affect the propensity to sell. Other factors, such as distance to market and exposure to government-supervised production schemes, also influence the decision to sell, and these factors are subject to influence by government policies and programs. Distance to market, in particular, is affected by the condition and e-Ktent of the transportation network. The transportation system in the study area is rudimentary at best. Study of the marketing cost structure indicates that transportation costs account for between 15 and 27 percent of the final retail price. High transportation costs serve to reduce the price incentive to the producer and are especially detrimental to marketing opportunities in more remote and isolated areas. A number of government policies were singled out as having possible detrimental impacts on maize sales and marketing. While the floor price is intended to serve as a stimulus to production, there is widespread confusion among government officials as to what it means. In fact, few farmers are even aware that such a policy exist, so it is difficult to argue that it could be serving as a production incentive. On the other hand, the official price ceiling on maize delivered to flour mills serves as a disincentive for farmers to produce and sell maize. There is a distinct price differential between t,,is ceiling price on domestic maize deliveries and the price which the same mills pay for import. The existence of such a differential suggests that reductions in imports and savings in foreign exchange could be attained by permitting the mill delivery price to rise to the import price level. This would simultaneously serve to stimulate local production and supply of maize. Coursier, C. J. 1974. Programme Engrais, AGRI/FAO. Rapport Technique, Compagne Agricole 197.2 et 1973. Technical paper. Food and Agricultural Organiation of the United Nations (FAO). 1962. Production Yearbook. Vol. 16. Rome. Food and Agricultural Organi:ation of the United Nations (FAO). 1963. PRoduction Yearbook. Vol. 17. Rome. Food and Agricultural Organization of the United Nations (FAO). 1966. Production Yearbook. Vol. 20. Rome. Food and Agricultural Organi2ation of the United Nations (FAO). 1968. Production Yearbook. Vol. 22. Rome. Food and Agricultural Organization of the United Nations (FAO). 1973. Production Yearbook. Vol. 2E. Rome. of Agricultural Economics, Kansas State University, Manhattan, Kansas. International Bank for Reconstruction and Development (IBRD). 1972. Agricultural Survey: Republiz of Zaire. Report No. PA-118a. Kamwanga Mulumba, K. B. 1973. Le Mais au Zaire. A thesis presented for the degree of Ingenieur Agronome. Universite de Kinshasa. [Li0] Kotler, P. 1971. Marketing Decision, A Model Building Approach, New York. of Philosophy in Agricultural and Resource Economics. SPSS. Second ed. New York. McGraw Hill. (14] Republique du Zaire, Ministere de l'Economie Nationale. 1974. Conjoncture Economique. Vol. 14. Kinshasa. Decembre. @ CIMMYT International Maize and Wheat Improvement Center The CIMMYT International Maize and Wheat Improvement Center holds all rights to the source text and shall be considered the copyright holder for the text and images of these publications. The CIMMYT International Maize and Wheat Improvement Center has made this publication available to the University of Florida, for purposes of digitization and Internet distribution. The CIMMYT International Maize and Wheat Improvement Center reserves all rights to this publication. All uses, excluding those made under "fair use"~ provisions of U.S. Code, Title 17, Section 107 are restricted. Contact the CIMMYT International Maize and Wheat Improvement Center for additional information and permissions.